Lower right: "(cartellino), sig:[r] mio videte / la strade di sa / lute per la / mano di sweerts"
Two European men in Middle Eastern dress pose in front of a parapet. The bearded man on the left gestures to the right, while the other man looks in the same direction and holds a cryptic message in Italian: Sig:r mio videte la strade di sa lute per la mano di sweerts (My Lord, see the way to salvation by the hand of Sweerts). The note's meaning and the identity of the two gentlemen have eluded scholars. 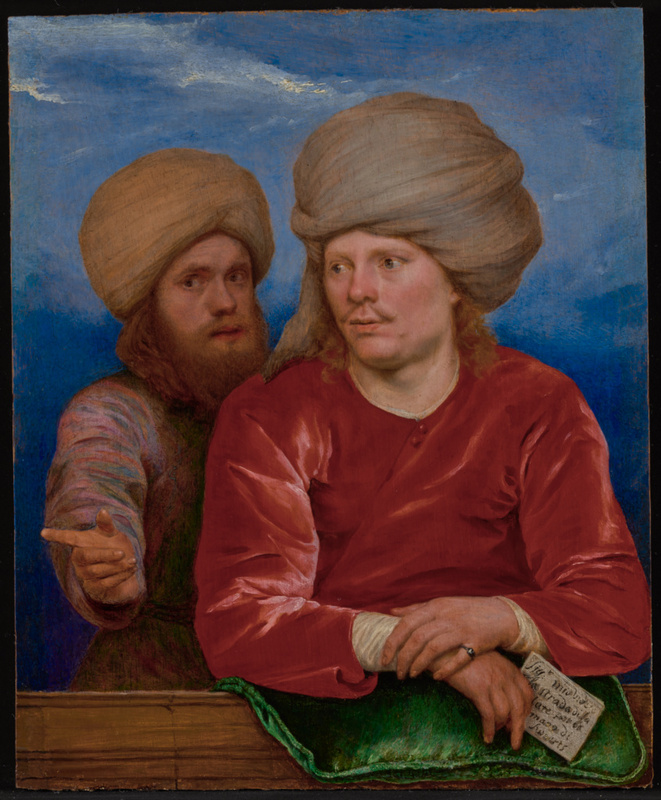 The two men appear to be individualized portraits, recalling the tradition of friendship portraits so popular in Northern Europe. The refined execution of this painting is typical of Flemish artist Michael Sweert's late style, practiced when he traveled in India as a missionary. "My Lord," then, may be addressed to the viewer, encouraging him to listen to Sweerts's preaching. With this double portrait, the artist may be urging the observer to find redemption through his belief in God, just as Sweerts did. Source: Amsterdam, Gemeentearchief NAA 3354, ff. 1675-1709; possibly the same as no. 27, "2 Armeniens de Cavaliere Swarte," recorded in a 1702 posthumous inventory. Source: Stechow. "Some Portraits by Michael Sweerts." The Art Quarterly 14, no. 3 (Autumn 1951). Source: Provenance Index: Belgian sales; Benjamin Perronet (Fredericksen memo); Stechow (1951). Source: Provenance Index: Belgian sales. Dr. Curt Benedict and Co. and Samuel Nystad Oude Kunst B. V.
A. Schwarz, died 1984/1985? (Amsterdam, The Netherlands), by inheritance to his daughter, Nettie (Schwarz) Vanderpol. Source: Kultzen and Di Carpegna. Michael Sweerts en Tijdgenoten, exh. cat. (Rotterdam: Museum Boymans, 1958). Nettie (Schwarz) Vanderpol, born 1926 (Boston, Massachusetts), sold through Samuel Nystad Oude Kunst B.V. (The Hague, The Netherlands), to the J. Paul Getty Museum, 1985. Martin, Willem. "Michael Sweerts als Schilder." Oud Holland 25 (1907), p. 154, no. 34. Stechow, Wolfgang. "Some Portraits by Michael Sweerts." The Art Quarterly 14, no. 3 (Autumn 1951), pp. 208, 212-13, 215n32, 215n33, fig. 4. Kultzen, Rolf. "Michael Sweerts (1624-1664)." Unpublished Ph.D. diss. (University of Hamburg, 1954), pp. 169-71, 218, 316, no. 90. Kultzen, Rolf, and Nolfo Di Carpegna, eds. Michael Sweerts en Tijdgenoten, exh. cat. (Rotterdam: Museum Boymans, 1958), pp. 59-60, no. 57, pl. 1. Kultzen, Rolf, J. C. Ebbinge Wubben, and Nolfo Di Carpegna, eds. Michael Sweerts e i Bamboccianti, exh. cat. (Venice: Museo di Palazzo Venezia, with Del Turco, 1958), pp. 55-56, no. 58, fig. 58. Plietzsch, Eduard. Holländische und flämische Maler des XVII. Jahrhunderts (Leipzig: E. A. Seemann Verlag, 1960), p. 211, fig. 389. Watering, William L. van de. Terugzien in Bewondering/A Collector's Choice, exh. cat. (The Hague: Mauritshuis, 1982), p. 212, no. 85. Liedtke, Walter A. "Clothing the Naked by Michael Sweerts." Apollo 117, no. 251 (January 1983), p. 23, fig. 2. "Acquisitions/1985." The J. Paul Getty Museum Journal 14 (1986), p. 216, no. 121. "New Accessions." Apollo 125, no. 299 (January 1987), p. 65, ill.
Kultzen, Rolf. Michael Sweerts: Brussels 1618-Goa 1664. Diane L. Webb, trans. (Ghent: Davaco, 1996), pp. 57n17, 73-75, 127, no. 123, fig. 123. Jaffé, David. Summary Catalogue of European Paintings in the J. Paul Getty Museum (Los Angeles: J. Paul Getty Museum, 1997), p. 124, ill.
Jansen, Guido, and Peter C. Sutton. Michael Sweerts (1618-1664), exh. cat. Duncan Bull, ed. (Amsterdam: Rijksmuseum, 2002), pp. 158, 159, no. 29, ill.
Mormando, Franco. "Pestilence, Apostasy, and Heresy in Seventeenth-Century Rome: Deciphering Michael Sweerts's 'Plague in an Ancient City.'" In Piety and Plague from Byzantium to the Baroque. Franco Mormando and Thomas Worcester, eds. (Kirksville: Truman State University Press, 2007), pp. 257, 304, 258, fig. 9.5. Yeager-Crasselt, Lara. Michael Sweerts (1618-1644): Shaping the Artist and the Academy in Rome and Brussels (Turnhout: Brepols Publishers, 2015), p. 225. pl. 23. Luis Nieto Fernández, The Painted Parapet: Structure and Symbolism (Madrid: Rayxart Investigacíon, 2017), p. 168, fig. 265.